Not having enough time to work out is one of the most popular excuses we have for not exercising regularly. With the daily hustle, commuting, parenting, cooking and everything in between, it’s safe to say it’s a pretty good excuse; but it still remains only that— an excuse. Working out regularly has an endless list of health benefits, from managing weight and fighting disease, to increasing energy and so much more. That’s why many of us at BPI Sports choose a lunchtime workout, fitting exercise into our day, developing good habits and staying on track. So what’s the best way to prepare for a workout during that lunch break and how do you maximize that hour? Yes, it’s an obvious tip, but if you don’t follow it and accidentally forget something, five days of working out can easily turn into two. Mornings are too busy to waste time looking for your gym clothes, headphones or towel. Pack everything you need for your lunchtime workout the night before! Include your clothing, sneakers, music, pre-workout snack (such as a Best Protein Bar™), deodorant, water bottle, etc. Meal prepping at home and packing your own lunch saves you time so you can spend more of it in the gym actually training. 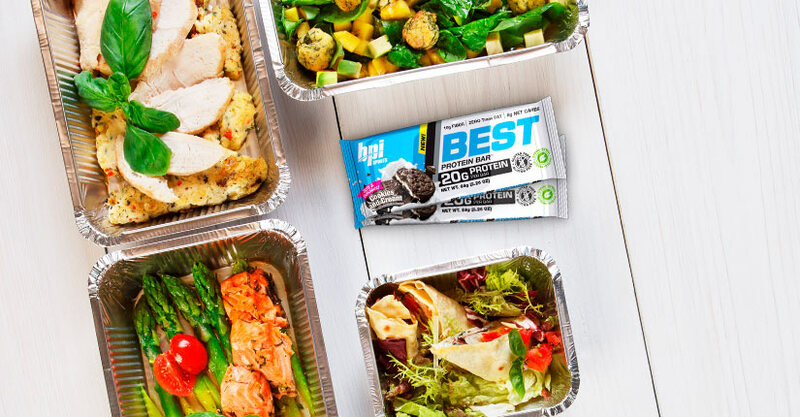 Plus, making your own lunch means you get to monitor your macros more closely, especially if you have a strict training regimen. For instance, if you know your lunchtime workout will be heavy on strength training, you can pack adequate amounts of protein for proper recovery. Those choices may not be available if you order in or step out for a quick bite, and meals prepared at home are almost guaranteed to be healthier than the local restaurants. After going to the gym a few times during your lunchtime, you’ll notice certain times are busier than others. For example noon may be a bit slower than 12:30 or 1PM. Find out the time that works best for you and still fits in that lunch hour. Typically, you’ll be able to play around between 12 and 1:30 pm or so. If you work in a smaller company, try asking your boss or supervisor for a later or earlier lunch hour, as it may be more convenient for you to go at 11 am or 2PM. It doesn’t hurt to ask! If you know what body part you’re working out on a specific day of the week, it’s easier to get started and maximize your training time. For example, if Monday is a leg day, then as soon as you walk in you know what to do. You’re not wasting time thinking about what’s next, wandering about or socializing. You have one goal in mind and that is to perform leg day exercises. If you’re trying out new exercises, watch workout videos and read up when at home so that once you’re in the gym, you know what to do and don’t spend time figuring to how to work the machines. If you can’t shower, just keep hair and makeup low key. Wear your hair in a pony tail, a braid, or even loose since you can always put it up for that one hour. You can also try dry shampoo, body wipes and a lip gloss to freshen up your look. Stay away from brightly-colored makeup, heavy foundations since that can clog your skin and even heavy jewelry that can take extra minutes taking off and putting back on.